When you think of deep fried chicken, fish, chips, donuts your mouth starts watering. Wait, leave the takeaway menu, and read a little further. You can make all these delicious delicatessens right in the comfort of your home with a deep fryer. Whether you need a deep fryer for your home or one for commercial use, we can help you out. 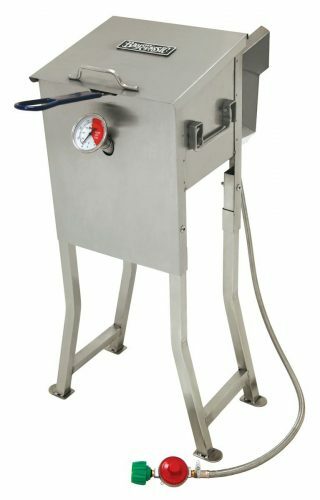 If you are ready to take the next step, view our editor’s choice of the top 10 best deep fryers in 2019 available here. Why you need a deep fryer? When you eat out at a restaurant, the chance is they use a professional deep fryer to prepare delicious deep fried food. However, in some instances, they are not practical to use at home. We do not agree as you can find a great commercial to small deep fryers that are accurate, reliable, and sturdy for home use. The deep fryers reviewed here have unique designs for both home and commercial use. Some of them can easily fit on the countertop while others need extra space. Cook up a KFC in a moment, as they are easy to use and offer you great features from adjustable thermostats to fry food at low or high temperatures as needed. Frying food may not be the healthiest option but you can agree it is delicious and one can enjoy it occasionally. For making, the best-fried foods you need an appliance that can hold its temperature between 350 – 375° F. Certain models have a digital display and help you to take out the guesswork when preparing food. Back in the day’s spending money on a deep fryer was cost ineffective. However, recently things have changed. You no longer need to use gallons of oil in the appliance and your electricity bill will not be high with the energy efficient designs of the deep fryers reviewed here. 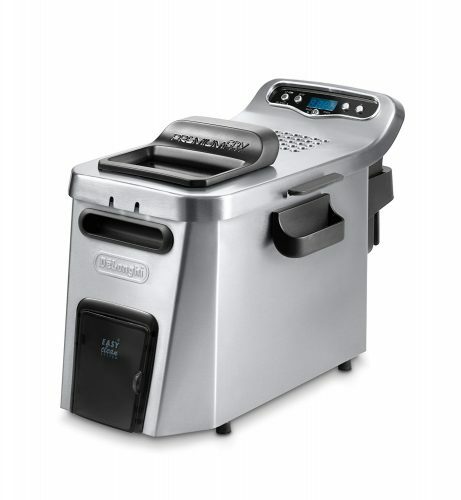 For a splatter-free fast cleaning deep fryer, look no further than the Hamilton Beach Professional Style model. With the generous size, the appliance gives you the versatility to enjoy fried crispy chicken and other mouthwatering foods. The appliance has a 12-cup oil capacity and includes two baskets. There is an immersed heating element to heat up the oil fast and it is easy to assemble and clean. The timers adjustable and have an audible tone letting you know when the food is ready. Further, it has a power light indicating the units working and has a ready light advising you when the oil is ready. View the food as it cooks through the window available on the lid. There are double baskets with hooks for ease of drainage and it has a breakaway cord. Included with your purchase you receive three baskets one large one for making big batches of food while the two additional baskets are great for preparing separate foods. The baskets have hooks for removing it from the oil and are dishwasher safe. If you are looking for a commercial professional deep fryer, the Yescom is ideal. The appliance has a temperature limiter to cut off power automatically when the unit breaks down. For protecting the deep fryer, it has an inching switch that cuts off the power automatically when the heads down while working. The machine has a stainless steel construction with a heating tube. For controlling the temperature there is a thermostat and it has a 60-minute timer. Cleaning the appliance is a breeze with the copper faucet drain and for preventing oil spillage it has a lid cover. The fryer basket has a cool touch handle and you can switch the device on/off with the switch. Further, a rotating head helps you while cleaning the machine. This is a single tank 10L electric deep fryer and suitable to use in supermarkets, snack bars, fast food shop and restaurants. If you are health conscious and still want to enjoy deep fried foods there is a healthier way. 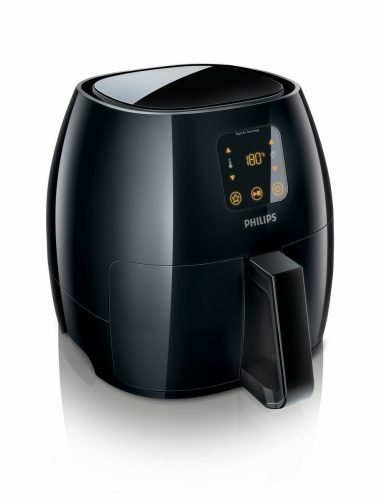 The Phillips Airfryer is now the new oil and you can enjoy eating your crispy treats with less than 75% fat. With the starfish design in the unit, it circulates hot air inside the appliance to cook food evenly. The other amazing thing about the air fryer is it does not leave an oil smell in the kitchen and is easy to clean. You can wash the removable basket in the dishwasher. To clean the base of the unit all you need is a damp cloth and soapy water. The air fryer has a 1.75 lbs capacity to fry your favorite food. You can even cook vegetables and more in it. Cooking with the device is easy by selecting the correct temperature and setting the time. The Philips Airfryer has an auto shutdown making sure the foods not overcooked or burned once the set times completed. The appliance uses power and cooks food quickly with a temperature ranging from 180° to 390° F. Now you can enjoy your favorite KFC chicken in the comfort of your home the healthy way. The other outstanding thing is you receive a 150+-recipe cookbook included with your purchase. Now if you need one of the best deep fryers, the Dual Zone model from DeLonghi is first class. The unit has an extra large food capacity and uses up to one gallon of oil. The appliance is suitable for home use and you can make delicious treats in the comfort of your kitchen. To set and monitor the food it has a digital timer and for ease of cleaning, it has an oil drainage system. The D34528DZ has an alarm informing you when it is the right time to change the oil. Further, there is an adjustable digital thermostat with an indicator light to set the frying temperature. DeLonghi used dual zone technology to design the unit and has a cool zone beneath the heating element. This helps prevent the food from burning. On the inside of the stainless steel lid, it has a permanent mesh filter preventing odors from seeping into the kitchen. You can safely view the frying process through the viewing window and the heating elements removable. The power cords detachable for safety purposes. If you need something smaller in the deep fryer range look at the 2.5-gallon Bayou Classic 700-725 model. The appliance has a stainless steel construction with a large stainless steel basket. The unit has the same V designed bottom as the larger models available in the range. For small get-togethers or a single family, this one is perfect. The benefit of using this model is it heats from the inside out and not from the bottom. 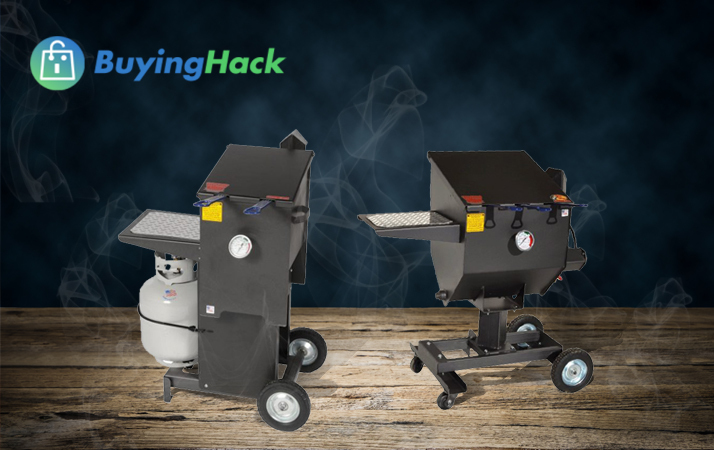 The jet burners mounted on the back and blow hot air straight into the middle of the oil, and prevent the batter from burning when used. This is a freestanding model and has two legs to bring it up to your waist level. Alternatively, you can place it on a tabletop. For ease of cleaning, it has a drain and made up of a built-in thermometer, stainless steel braided hose and a 10-PSI regulator with a control valve. Take your outdoor cooking to a new height with the Metal Fusion 2290 Deep Fryer. This multi-purpose propane deep fryer has a 36-quart steel rectangular pot with a spigot. The cooker has a recessed top with snap on legs and a 24,000 BTU tubular steel u-shaped burner. There are two chrome plated baskets and a listed LP hose with regulator. 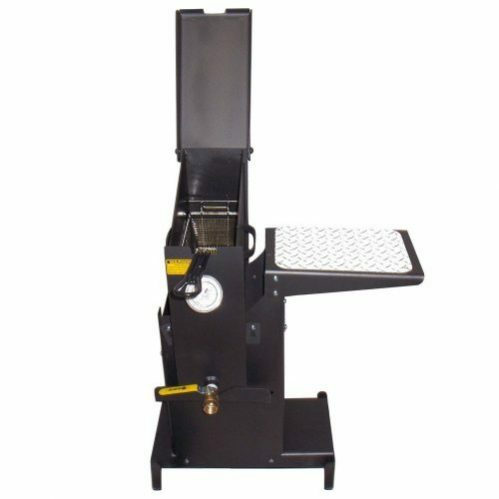 The product weighs 52 pounds, has a dimension of 18.75-inches wide, and stands 25.75-inches high with a width of 18.75-inches. Further, the V-bottom pot fits inside the cooker body for added safety and you can easily remove it for cleaning. The pot has a hinged lid with a spiral grip handle that is cool to touch. Compared to the Cajun Fryer the Barbour International 700-701 is a four-gallon appliance constructed of stainless steel. What makes the appliance, unique is the V-bottom design keeping oil temperatures lower at the bottom. This prevents the batter from burning and keeps the oil clean. You can cook some delicious crispy fish and French fries in it. The appliance has two stainless steel baskets with cool touch handles and a temperature gauge. For ease of cleaning Bayou Classic designed it with a drain valve with extension legs. The unit works with gas and has a 10 PSI preset regulator with a stainless braided hose included. The way it works is as follows the heat flows through the rear tube of the deep fryer and rolls the oil as it travels through. Cook up big batches of fried chicken, chips and more in the 6-gallon two baskets Cajun Fryer from R&V Works®. The outdoor appliance is portable and has a burner/flue above the oil reserve sitting at a 45° angle preventing food from collecting on the burner. There are two baskets and with the large capacity, you can cook food for up to 40 people per hour. With the thermometer on the front, you can keep an eye on the oil temperature. The fryer baskets have cool-to-the-touch handles to prevent it from burning. 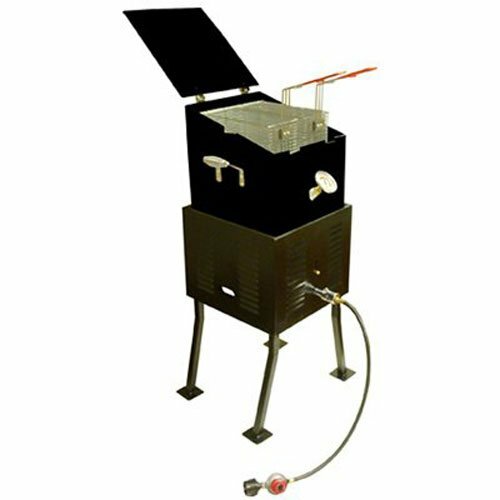 The burner heats up the oil to 120° and has a drain valve for ease of cleaning. You can use propane gas or natural gas with the deep fryer and comes with a lifetime-limited warranty. 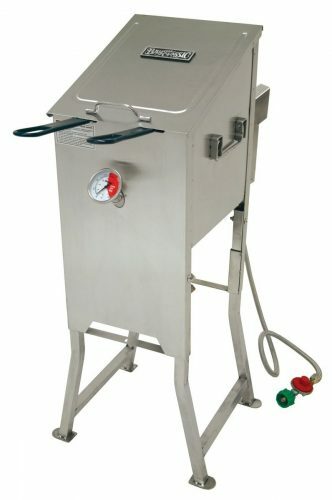 The FF1-R Cajun Fryer from R&V Works® is a single basket model compared to their previous model. 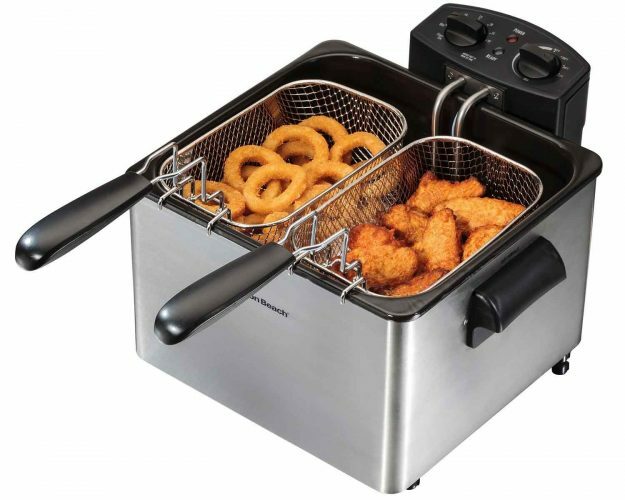 With the appliance, you can bring delicious tastes of fried food to your clients. The units perfect for commercial and home use and with the unique design, it is great for outdoor use. For preventing batter and food, collecting on the heating element it has an angled burner/flue. All food particles collect at the bottom in the cool area of the fryer. Further, it helps you to save on using clean oil continuously. The deep fryer is a 2 ½-gallon model that is capable of serving up to 15 people per hour with great food. For frequent traveling to picnics, tailgate parties or camping, the unit has a compact design with wheels to take with you anywhere. 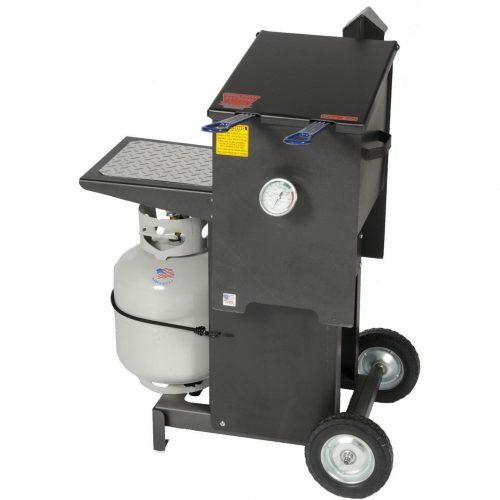 You can use the unit with propane gas or natural gas. The deep fryer includes the cooker and stand and has a limited lifetime warranty. If you are planning to start a takeaway business or would like to open up a restaurant, you need a commercial deep fryer. 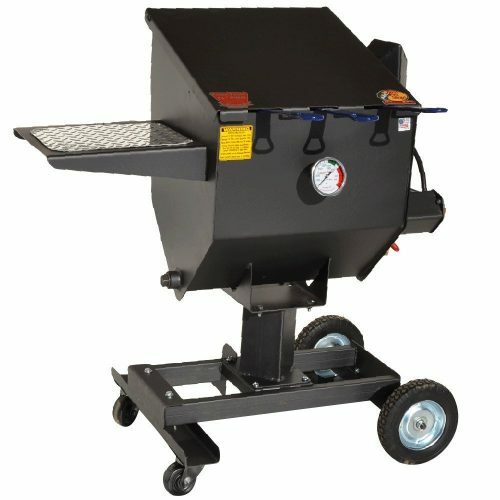 The Cajun Fryer from R&V Works® is a heavy-duty appliance with an 8.5-gallon capacity to fry from vegetables, fish to meat. Above the oil reservoir, it has a heat source placed at a 45° angle. This feature helps to ensure that the batter and food particles fall to the bottom and does not land up on the burner. Further, it helps with reducing oil usage that can cost you a bit when you have a restaurant. The deep fryer has a durable carbon steel structure and an amazing charcoal finish. The appliance stands on an all-in-one stand and has a diamond-plate side table. There are three large nickel-plated baskets and the handles are cool to touch. One standout feature is the built-in thermometer allowing you to monitor the cooking temperature. You can move the unit around with the wheels and works with liquid propane. This is a great way to use it for food stalls at a market or for events. Difficult to clean and we recommend you order a drain hose with it. Finding the right deep fryer for your home or business has never been easier. We hope that our top 10 best deep fryers reviews helped you to find one best suited for your needs. 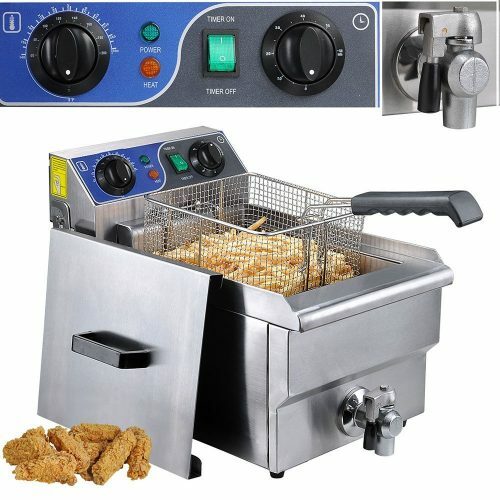 Whether you need a small appliance or a professional deep fryer the models available here will get you frying chicken, fish, French fries, and other delicatessens in no time.